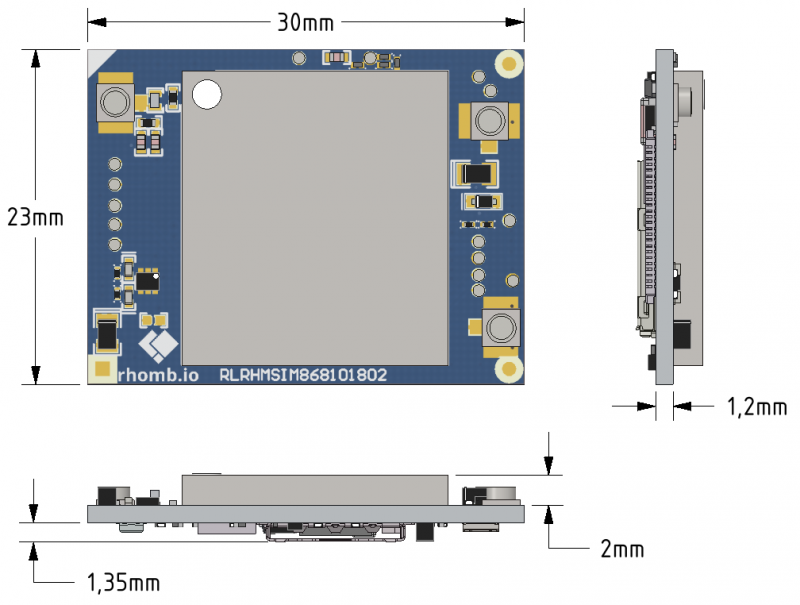 The S100 Slave - GPS-GPRS SIM868 is a certified Rhomb.io module that allows GPRS low speed communication and GNSS possitionining. Even more, it has an optional Bluetooth communication interface. The GPRS part, it is quad-band 850/900/1800/1900 MHz GSM/GPRS, with maximun speed of 85.6 kbps, available in eSIM and nanoSIM versions. The GNSS part has a low power consumption performance and supports various location applications including GPS, GLONASS and BEIDOU. About the optional part, it is Bluetooth 3.0 compliant (firmware upgrade required). All three parts has a 50Ω UMCC antenna connector for each one. The next figure show a 3D view for the S100 Slave - GPS-GPRS SIM868. The S100 Slave - GPS-GPRS SIM868 has been build around the SIM868 chipset from SIMCOM Technology. 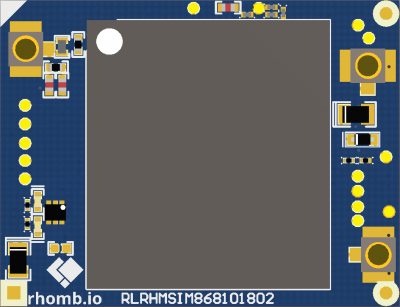 The SIM868 is integrated with a high performance GSM/GPRS part and a GNSS part. The GSM part is a quad-band GSM/GPRS that works on frequencies GSM 850 MHz, EGSM 900 MHz, DCS 1800 MHz and PCS 1900 MHz. GSM features GPRS multi-slot class 12/class 10 (optional) and supports the GPRS coding schemes CS-1, CS-2, CS-3 and CS-4. The subscriber identity module (SIM) can be a nano SIM card with the SIM holder version or a embedded SIM in the eSIM version. The GNSS part solution offers best-in-class acquisition and tracing sensitivity, Time-To-First-Fix (TTFF) and accuracy. With built-in LNA, GNSS doesn’t need external LNA. GNSS can track as low as -167 dBm signal even without network assistance. The GNSS has excellent low power consumption characteristic (acquisition 24 mA, tracking 22 mA). GNSS supports various location and navigation applications, including autonomous GPS, GLONASS, BEIDOU, QZSS, SBAS (WAAS, EGNOS, GAGAN, and MSAS) and A-GPS. The Bluetooth Interface of SIM868 is compliant with Bluetooth Specification 3.0. 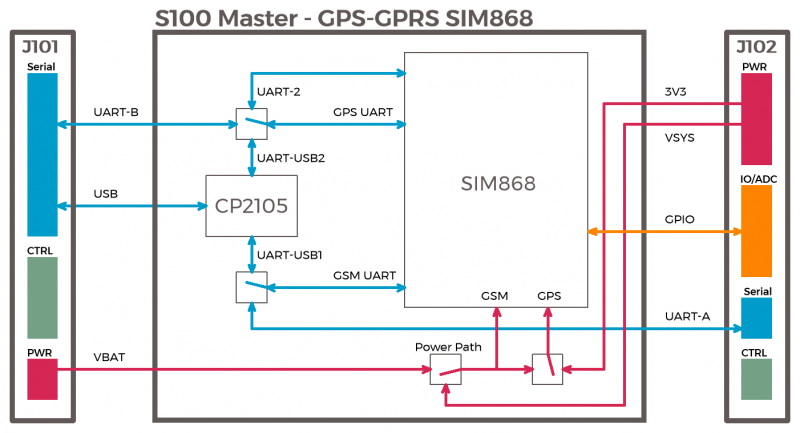 The S100 Slave - GPS-GPRS SIM868 can be controlled using two UART connections or through a high-speed USB interface thanks to the integrated USB controller CP2105. All three parts can be controlled using AT commands in Main UART interface, although it is recommended to use the secondary interface for GPS data because of the amount of frames required. 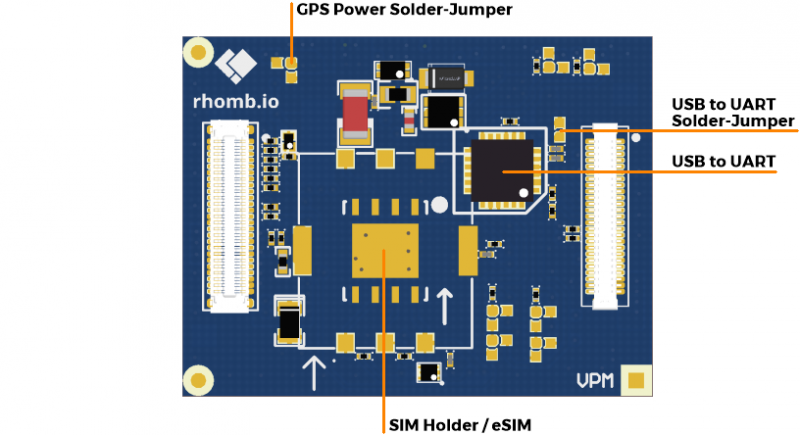 GSM UART can be connected to the Rhomb.io UART-A interface (default) or to the USB to UART IC. 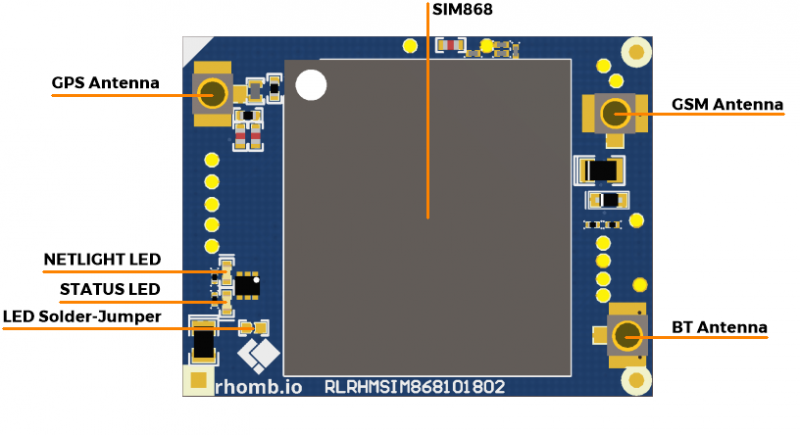 GPS UART can be connected to UART-2 interface of the SIM868, to the Rhomb.io UART-B interface (default) or to the USB to UART IC. Two LED are assembled on the module in order to give status feedback to the user. The LED turn on when the "STATUS" and "NETLIGHT" from SIM868 are active. These LED can be disabled by open the "LED solder-jumper". I2C-A: By default, this interface is disabled. You must to assemble the R44 and R46 0R0 resistors to use it. UART-A: By default, this interface is connected to UART1 port of the SIM868 (GSM). If you want to use the USB to UART IC, you must to assemble the R37 and R39 0R0 resistors. 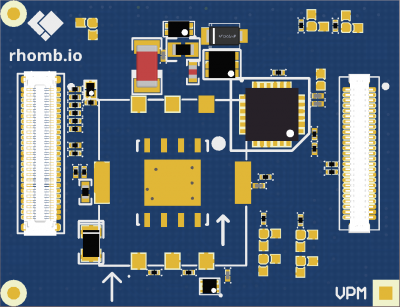 UART-B: By default, this interface is connected to GNSS serial port of the SIM868. If you want to use the USB to UART IC, you must to assemble the R26 and R30 0R0 resistors. If you want to use the UART2 port of the SUM868, you must to assemble the R25 and R29 0R0 resistors. The following table summarizes the GPIOs and Control Signals used on the S100 Slave - GPS-GPRS SIM868. This table relates the signals of the Rhomb.io standard with the net names of the schematic and with the components to which they are connected. IO: IO0 enables de load switch that supply the GSM module. The S100 Slave - GPS-GPRS SIM868 can use the 3.3 V rail, VSYS rail and VBAT rail. Make sure these rails are enabled on the motherboard you are going to plug this module. The GSM part is powered by VSYS or VBAT rails. The GPS part can be powered with the same rail as GSM part or with the 3.3 V rail, you can choose the voltage shorting the corresponding solder-jumper. VRTC signal is powered by 3.3 V rail. The USB to UART IC is powered by 3.3 V rail. You can disconnect the IC by open de "USB to UART" solder-jumper. SIM868 is designed with power saving technique so that the current consumption is as low as 0.65 mA in sleep mode (with GNSS part power off). The GNSS has excellent low power consumption characteristic (acquisition 24 mA, tracking 22 mA). Anyway, the power consumption varies with different power modes/sleep patterns and work statuses of functional modules. See the SIM868 datasheet to find more information about power consumption. This page was last modified on 8 April 2019, at 10:19.